It wasn’t only the Greek God’s weak spot. Many a GAA, rugby or soccer player have also come a cropper by rupturing the strongest tendon in the body. Here’s a recent Achilles tendon rupture. The sufferer is six weeks post op. Note that post operatively the tendon’s diameter is increased to almost twice the normal thickness due to suturing and scar tissue formation. 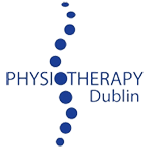 Physiotherapy post operatively consists of graded calf stretching to lengthen the tendon, and soft tissue manipulation to assist with ankle mobility and adhesion breakdown. The Achilles tendon is about the thickness in diameter of your baby finger so when it ruptures it’s painful. Classically, sufferers hear a pop, usually when playing a field sport, and look behind for whoever has kicked them in the calf. However, it’s a non-contact injury so there’s nobody there and the pop was your Achilles snapping and retracting up the calf. Achilles ruptures usually happen to patients with a history of Achilles tendonitis. This is significant as it indicates that the tendon was not fully healthy prior to rupture. Generally, we see these injuries in GAA, Soccer and Rugby players in there mid to late 30’s and beyond. More rarely they’re encountered in the 20’s. Surgical and non-surgical repair options are available to patients. The above patient had a surgical repair and made a return to running 4 months’ post operation having completed his physiotherapy, proving that the Greek God would have been no match for a Junior Gaelic footballer.